Your hair is so soft! 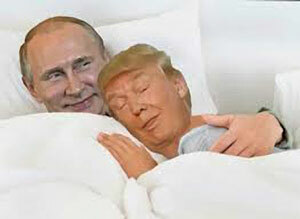 Donald Trump has successfully been debriefed by his KGB handler, Vladimir Putin. Trump entered Helsinki today and managed to pass information on to Putin via a translator. In return Putin publicly laughed off any suggestions that he might have info on Trump or his family and strongly denied allegations of tampering with US election results. Putin is believed to have instructed Trump to put on a show of unity without making it look too obvious and to dismiss White House Aides who verbalise allegations regarding the elections, especially those with actual proof. Trump declined to kill some of his more vocal opponents as he felt this may completely blow his cover and Putin conceded this point. In a show of support Putin presented Trump with a 14 karat gold locket inscribed "Together We Can Rule The World." Trump presented Putin with a lock of his hair.